Advising & Registration Information for undergrads currently enrolled for spring 2019*: Please take the time to read this information thoroughly. The summer and fall 2019 course schedules are now available on the Registration tab of my.mcad.edu, as of April 5. In order to search courses: You will need to read, accept, and submit the Disclosure and Enrollment form online before you will be able to search courses. Your degree audit is on the Academic Advising tab under "My Degree Progress". 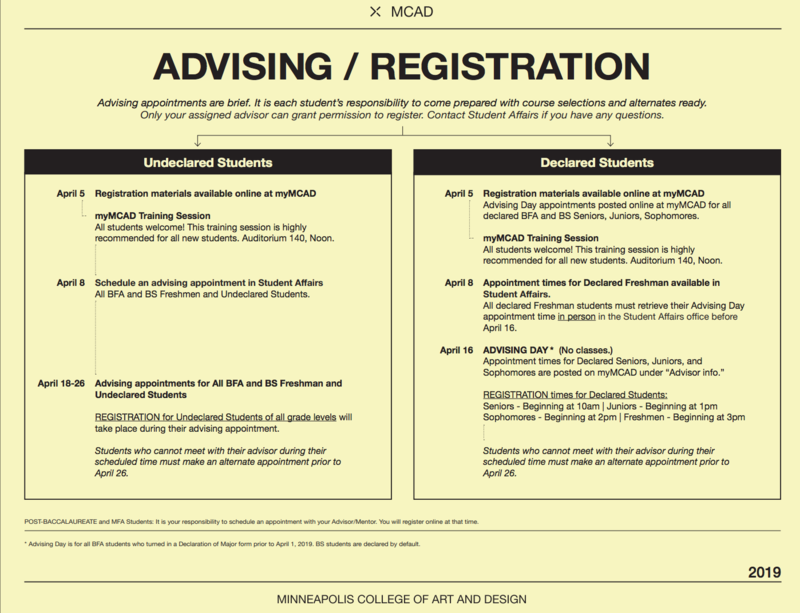 -->Declared seniors, juniors, and sophomores: Advising appointments will be visible on the Academic Info tab on my.MCAD.edu some time today (April 5). Be sure the date is set to April 16 (Advising Day) when searching appointments. -->Declared freshmen: Stop into Student Affairs, M104 for advising time. --> Undeclared BFA students: Stop into Student Affairs to make an appointment for advising and registration. Appointments can be made starting Monday, April 8. Appointments are available Thursday, April 18 through Friday, April 26. You must receive registration clearance from your advisor prior to registration. Advisors will grant this during advising appointments. You will not be able to register if you have a business hold on your account. Please check the Student Account tab on my.MCAD.edu and resolve any balances well in advance of your advising appointment. Declared seniors can register online at 10 am on April 16. Declared juniors can register online at 1 pm on April 16. Declared sophomores can register online at 2 pm on April 16. Undeclared students will register during their advising appointment, made in Student Affairs. Online registration will close on Friday, April 26 at 6 pm. my.MCAD.edu training will be held on Friday, April 5 at 12 pm in Aud. 140. All students encouraged to attend! Please contact Records if you have any questions. * MFA and MA students: Contact your program director for registration instructions. * New students starting in fall 2019 will be emailed advising and registration information in May. * Returning students contact me to make registration arrangements.